OH.MY.GOD!! These were so good, even if it was just a standard sponge recipe (see below) with standard basic buttercream swirls. Needless to say, I made these about 3 days ago. I made 24 of these vanilla cupcakes with the buttercream swirls and they’re now ALL gone! =)) My children made their own basic sponge cupcakes, so really, these were eaten by just myself and my partner (although the kidlets did have a few). I left to cool overnight as my illness means that I often feel bad in the daytime (I guess morning arthritic stiffness, I need oiling!) so therefore I usually bake in the early evening but most of the time in the late evening! :O Iced them with the basic buttercream recipe (see below). To be honest, I haven’t dealt with buttercream much and this was my first time swirling icing on cupcakes. Basically, the basic buttercream recipe I used isn’t really good for swirling with cupcakes. Think it’s more of a cake filling recipe but as I’ve said many times before, you live and learn. The buttercream was OK to swirl but was rather slightly liquid. I thought it might’ve been because I coloured it with gel/paste food colouring (a time before, I used liquid and it ruined it). I therefore posted this question on the Cake Central forum and the lovely ladies helped me by stating I needed more icing to make the cupcake swirls more firm. So I’m glad it wasn’t the colouring (wayheyy!) I also wished I had flavoured the buttercream. Should of added a tsp or 2 of vanilla extract. I’ll definitely be doing these again, in a range of funky colours, and flavouring. Must get in more flavours too. Bake in the oven from 15-18 minutes. Note: As I said before, I wouldn’t recommend this recipe for piping swirls. 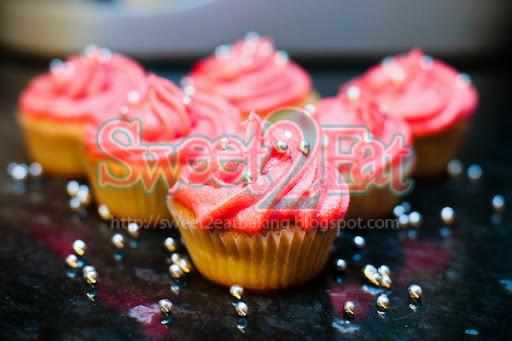 For piping swirls, adjust the icing sugar quantity from 10 oz to 16 oz as recommended on Cake Central. Beat the butter in a large bowl until soft. Add half of the icing sugar and beat until smooth. Add the remaining icing sugar and one tablespoon of the milk and beat the mixture until creamy and smooth. Beat in the milk, if necessary, to loosen the mixture. Stir in the food colouring until well combined. I would not recommend using liquid food colouring as it makes the icing more liquid (which is fine for runny icing). I used a gel/paste food colouring but powder will work just as good too.